le station de métro Shanghai Disneyland étant ouverte, beaucoup de monde s'est rendu dans le coin notamment le week end dernier pour la Fête du Travail (week end de 3 jours pour les chinois). Vu l'état et dégradation à la fin du week end, ça fait craindre le pire pour l'opening. Photo : James T. Areddy / The Wall Street Journal. 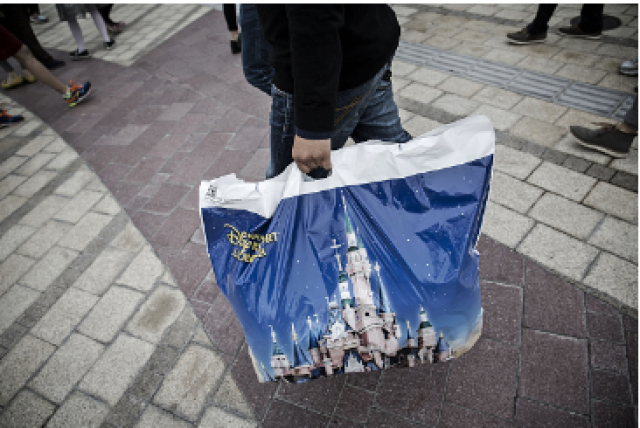 Shanghai Disneyland Draws Crowds—and It’s Not Even Open Yet. 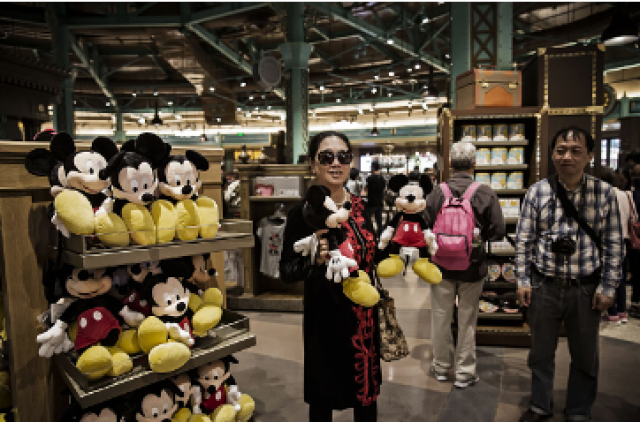 SHANGHAI—On her weekend off, saleswoman Liu Jiahui and a couple of friends rode the subway for two hours and then waded through thick crowds to experience China’s newest theme park: Shanghai Disneyland—some six weeks before it officially opens. Disneyland’s periphery is drawing thousands of people daily, as anticipation builds for the park’s long awaited opening in mid-June. Some, like Ms. Liu, rode the subway to a newly opened jumbo-size station with colorful silhouettes of Mickey Mouse on its escalators. On a multilane boulevard that passes yet-inaccessible Toy Story Hotel, a Rolls Royce was among the cars stuck in a crush of Saturday traffic that included cement mixers and utility trucks. 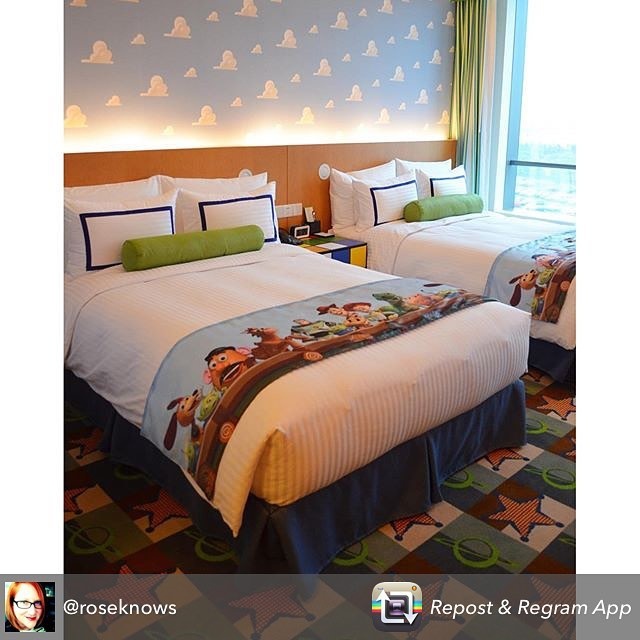 Last week, a Shanghai air carrier said it began flying a Disney-themed Airbus A330. 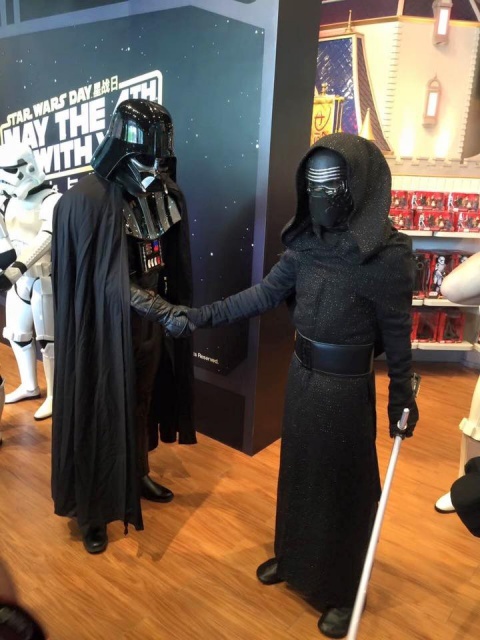 Disney appears to be bracing for high demand initially. Peak pricing around $76 will apply during the half-month grand-opening period starting June 16, before falling to $57 for regular adult admission. Also, tickets trading online suggest premium prices for entry to trial park operations beginning May 7. 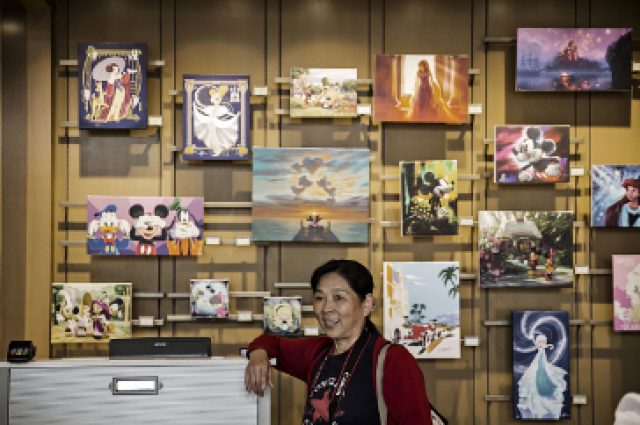 Some visitors over the long holiday weekend said increasing media coverage made them curious to tour the newly accessible and free “Disney Small Town,” as the resort’s Disneytown commercial zone translates in Mandarin. Disneytown is part of the $5.5 billion Shanghai Disney Resort, though it is technically outside the Disneyland theme park. Families with children and elderly couples took selfies around a fountain featuring Steamboat Mickey in front of the park’s covered main gate. A hundred meters of crowd-control barriers guided a steady stream of visitors along the resort’s lakeside and over a winding red bridge toward Wishing Star Park. Many visitors held umbrellas against the bright sun, as they strolled past Disneytown’s unopened stores, one of whom had a Lego airplane popping out of the top. The only people inside restaurants were waiters getting trained. 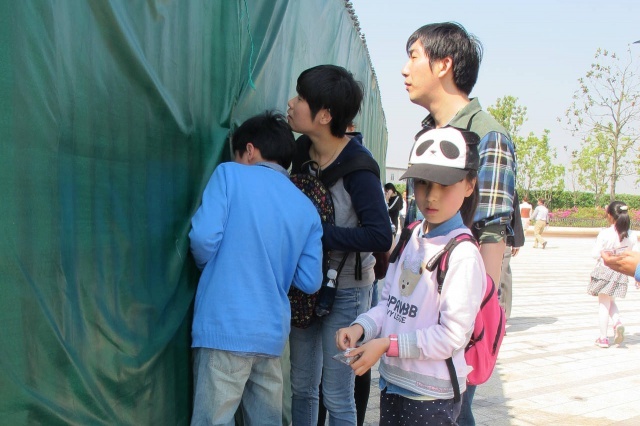 Sightseers peeked in windows and took more selfies at the entrance to Walt Disney Grand Theater, where billboards tease coming performances of a Mandarin version of the “Lion King” musical. Sweepers in white and blue grabbed trash as it hit the pavement. Security staff at times struggled to keep short-cutters from trampling plants. For every complaint about parking at $9.25 a day, visitors had positive comments about the clean toilets and free water. In the only business going, kiosks did brisk sales of ice pops. The hype confused some. “Nothing up there,” said a woman after pressing for a look at a belfry decorated with mouse ears. The spokesman said there is a broad understanding that most facilities aren’t opened yet. 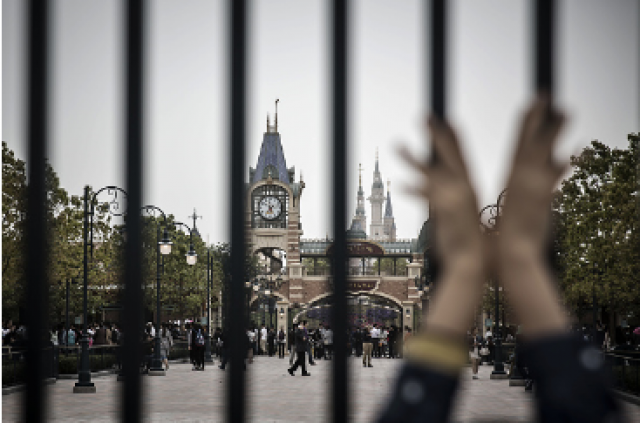 For many, Shanghai Disneyland has been a long wait. 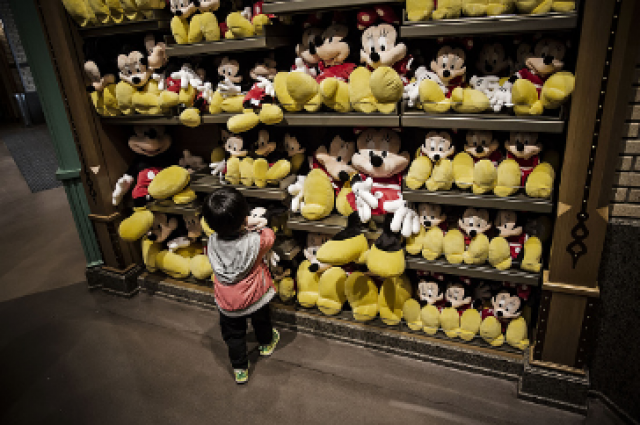 “My name is Mickey,” 53-year-old Wang Jianqing said jokingly, waving a thick white glove like the one worn by Mickey Mouse. A park attendant had lent it to her. “If anyone wants to borrow the glove, I’ll let them—and a lot do,” the young man said. 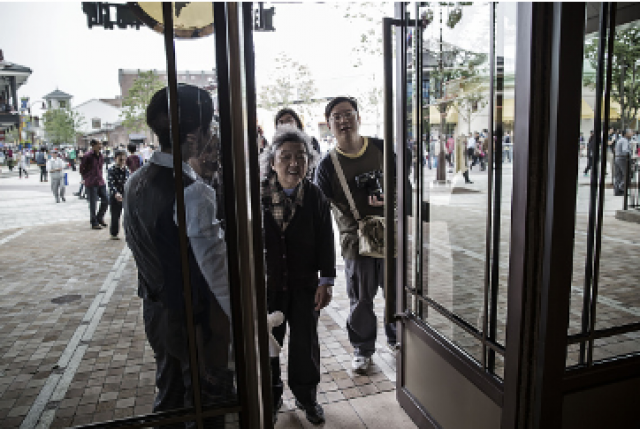 As Ms. Wang and two girlfriends took photo after photo at the closed entrance to a Chinese restaurant, she said she had visited the “cute” Tokyo Disneyland once and is excited Shanghai’s park will be much larger. “I feel like I’m kind of older and I want to grab the tail of youth,” she said. The Wall Street Journal - 1er mai 2016. 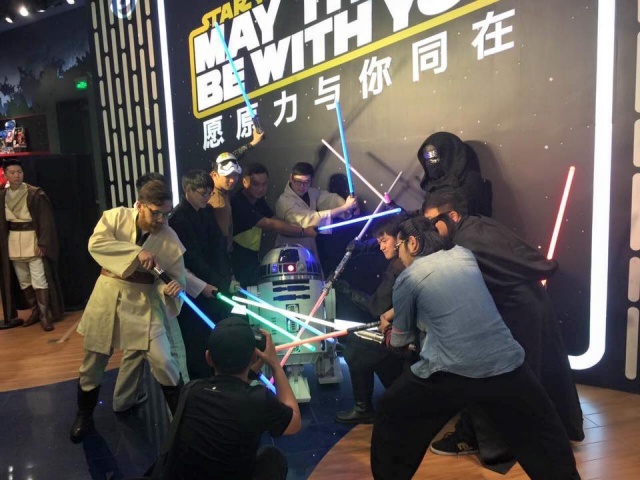 Le Disney Store de Shanghai Lujiazui célèbre également la Journée Star Wars ! Chinese President Xi Jinping met Thursday with Bob Iger, vice chair of US-China Business Council (USCBC) and chairman and chief executive officer of the Walt Disney Company. There are extensive areas for China and the United States to cooperate, Xi said, calling on both sides to view the big picture, maintain and expand mutual interests and deepen practical cooperation. Xi applauded the USCBC and Walt Disney Company for their efforts to boost bilateral relations with China. China is striving to advance economic structural reform and foster a more open economy, Xi said. "China will provide convenience for foreign businesses, institutions and individuals to have exchanges and cooperation with China." Xi said economic cooperation is an important component of China-U.S. relations and that China and the United States, with strong economic complementarity, enjoy great potential for cooperation. "China is in favor of reaching a bilateral investment treaty through negotiations at an early date," Xi said. Acknowledging the importance of U.S.-China cooperation, particularly in trade, Iger said the the U.S. supports an early investment treaty through negotiations, which will help businesses in both countries to expand cooperation on the basis of mutual respect and benefit. 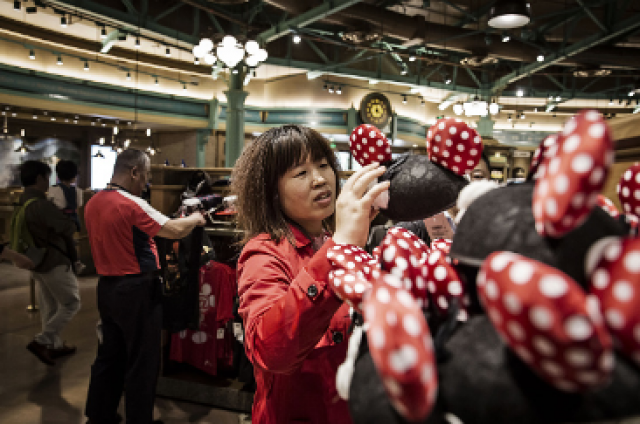 Disney attaches great importance to promoting the culture exchanges between the U.S. and China. The Shanghai Disney Resort, which will open soon, will work to offer safe, quality and pleasant services to the Chinese visitors, Iger said. 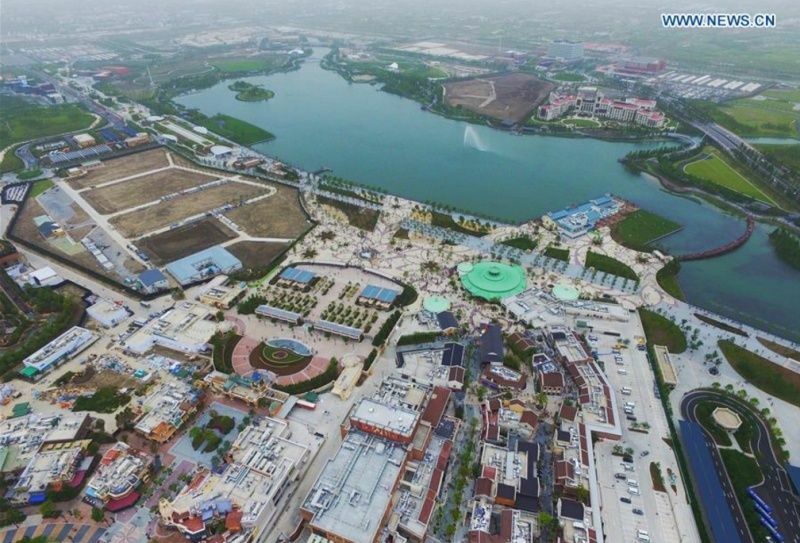 Shanghai Disney Resort, Disney's first theme park on the Chinese mainland, is located in Shanghai's premier development zone of Pudong and is expected to open on June 16. CCTV - 6 mai 2016. The Hollywood Reporter - 5 mai 2016. 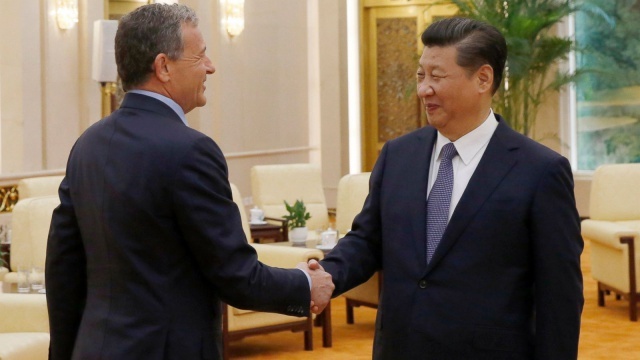 Disney chairman and CEO Bob Iger Thursday met with China’s powerful president Xi Jinping. The meeting took place at the ceremonial Great Hall of the People in Beijing. 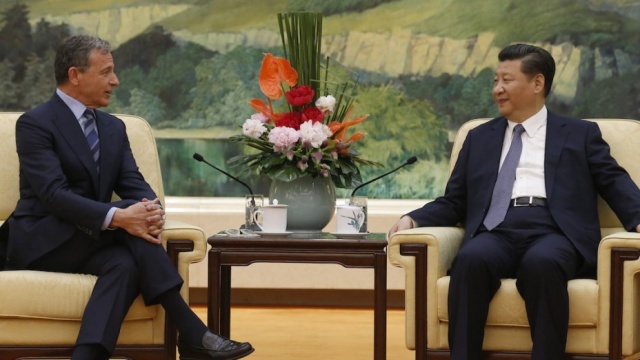 It is considered rare for Xi to meet with foreign business leaders, especially in public. 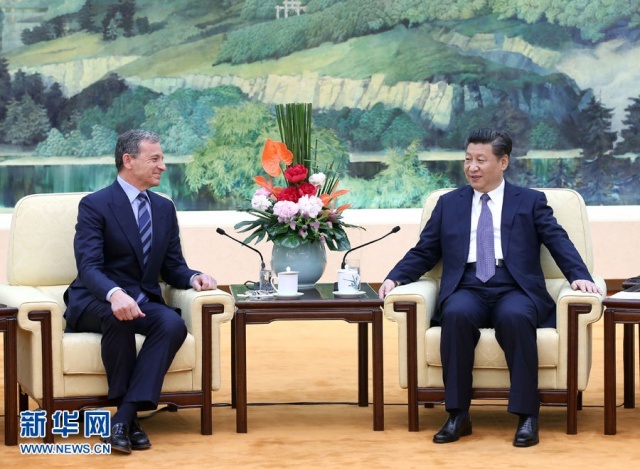 Iger is also vice chairman of the U.S.-China Business Council. 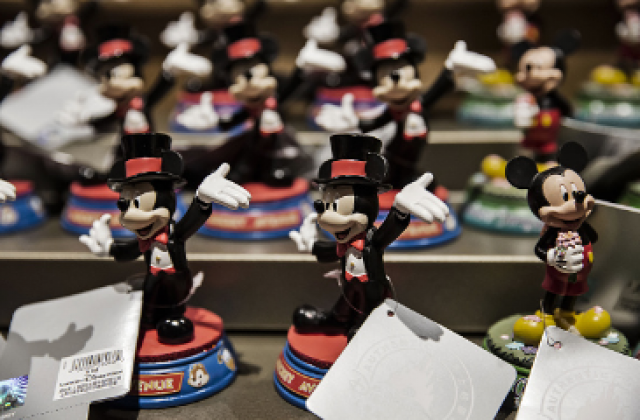 The meeting took place some six weeks before the opening of the Shanghai Disney Resort theme park in Shanghai. 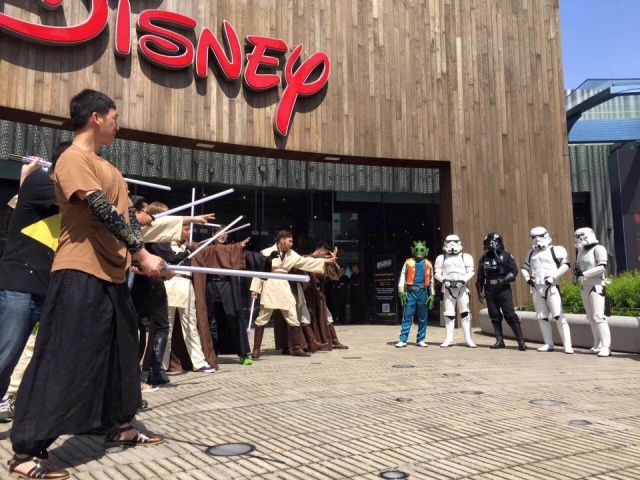 It also took place shortly after it emerged that China had closed down DisneyLife, a streaming video service that Disney launched at the end of 2015 in a joint venture with Alibaba. Xi is understood to have called for the deepening of cultural and commercial relations between China and the U.S.
His comments also come at a time when a growing number of foreign companies operating in China have complained about rules, regulations and business practices being loaded in favor of Chinese businesses and against foreign enterprises. Variety - 5 mai 2016. Shanghai Disney Resort today announced that it will begin a six-week Trial Operations period with invited participants on May 7, leading up to the resort’s Grand Opening on June 16, 2016. A Trial Operations period is a key pre-opening step for all Walt Disney Parks and Resorts destinations and major attractions around the world. At Shanghai Disney Resort, the Trial Operations period allows invited participants to experience select attractions, entertainment and dining on select dates. Participation in this Trial Operations period is invitation-only. Shanghai Disney Resort - 6 mai 2016. Shanghai Disney Resort and China UnionPay have entered into a multi-year strategic alliance which recognizes China UnionPay as an official alliance participant and the official card of Shanghai Disney Resort. Additionally, China UnionPay will be the presenting sponsor of the Soaring Over the Horizon attraction. Located in Adventure Isle area of the theme park, Soaring Over the Horizon will make its official world premiere at Shanghai Disneyland on June 16, when the resort has its official grand opening. The attraction transports guests on an incredible around-the-world journey—“flying” over Earth’s iconic landmarks, cities and natural attractions, including such Chinese locales as the Great Wall and the Shanghai skyline, as well as such international destinations as Sydney Harbor and the Matterhorn mountain in the Swiss Alps, among many others. 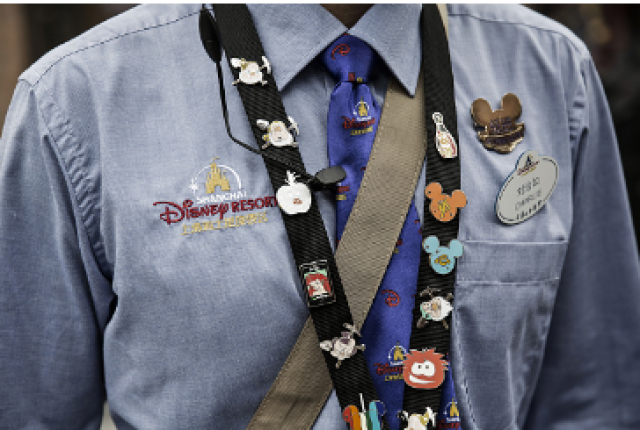 Through this agreement, guests will be able to use their China UnionPay cards at point of sale locations throughout the resort, including in Shanghai Disneyland, World of Disney Store and Spoonful of Sugar in Disneytown, and at the two resort hotels – Shanghai Disneyland Hotel and Toy Story Hotel. “We look forward to helping Shanghai Disney Resort welcome millions of guests, both from China and from throughout the world, to this world-class destination. China UnionPay will be the official card throughout the resort,” said Ying Hu, Assistant President of China UnionPay. Le style de l'Hôtel n'est pas de l'Art Déco, mais de l'Art Nouveau. L'Art Déco a des formes un peu plus cubiques que l'Art Nouveau. 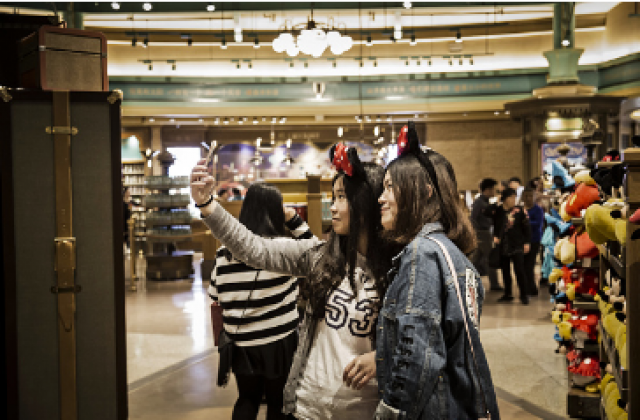 Tourists pose for photos at a souvenir shop in the Disney Town of the Disney Resort in Shanghai, east China, May 7, 2016. 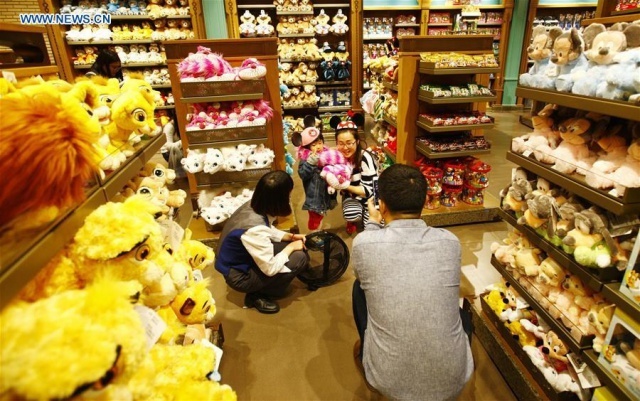 Two shops in the Disney Town opened on Saturday, when the Shanghai Disneyland, Disney's first theme park in the Chinese mainland, started an operational test. Shanghai Daily - 7 mau 2016. À noter les paroles de la chanson "It's a small world" écrite sur une fresque murale et les affiches d'attractions de parcs à thème autour du monde dont trois proviennent de Discoveryland (Space Mountain - De la Terre à la Lune, Orbitron (Machines Volantes) et Videopolis). J'ai juste un peu de mal à comprendre comment parmi la flopée d'attractions formidables de Tokyo, on en vient à choisir The Crystal Palace et Turtle Talk. On retrouve à côté D-Street (streetwear) et Tren-D (vêtements et accessoires féminins). Cette dernière a droit à un lustre ornés d'assiettes sur lesquels sont représentés des croquis de personnages Disney. Wishing Star Park et son lac sont une zone très agréable. Le Shanghai Disneyland Hotel de l'autre côté peut être rejoint en bateau par les clients qui y logent sinon ils peuvent marcher environ 15 minutes. De jolis marécages fleuris parsèment le tour du lac. Une aire de jeux aux couleurs flashies jure un peu. Au centre un jet d'eau constant (comme à Genève). Pour moi le problème vient de la vue alentours. Là où depuis Inspiration Lake à Hong Kong Disneyland Resort, on est entourée de montagnes magnifiques, ici on voit d'imposants pylônes électriques, les backstages de Treasure Cove et surtout (et on le voit même depuis la sortie principale du métro), le dos de la montagne d'Adventure Isle avec toute sa structure métallique à nue. Alors oui on a déjà ce genre de cas ailleurs (le dos de Tokyo DisneySea en monorail ou depuis les hôtels partenaires ; le dos de Cars Land depuis la route ; le dos d'Expedition Everest depuis Disney's Blizzard Beach) mais jamais ce n'était dans un lieu où le visiteur est supposé s'immerger totalement (par exemple en quittant le Shanghai Disneyland Hotel et en se rendant au Parc en ferry). Un avis plutôt mitigé au final dû à ces quelques imperfections même s'il faut admettre que j'y ai malgré tout passé un agréable moment tant le coin est agréable. Mais il est clair que pour moi, en terme d'immersion et de qualité de Resort, Hong Kong Disneyland Resort reste le plus beau de tous (dommage qu'il y ait si peu à y faire). Dommage car il y a un certain retour en arrière là où il y avait eu amélioration avec Disneyland Paris puis Hong Kong Disneyland Resort de ce point de vue là. Je retournerai à Disneytown et Wishing Star Park mercredi ou jeudi, sous le soleil cette fois (ça peut jouer). Perso j'aime pas du tout. Mon préféré reste celui de Californie que j'ai découvert l'année dernière, et qui est étalée sur plusieurs salles, ce qui permet de faire plusieurs univers. dommage que la météo soit pluvieuse en ce moment sur Shanghai !